We Weren't Born Craving Sugar, It's Something We Learned. I don't know about you, but there are times when my cravings get out of control. In the past, instead of resisting, more often than not I'd give into the cravings. Rather than satisfying me, the more refined sugar or carbs I'd eat, the more I'd want. The cravings are actually easier to overcome than we think! After all we aren't born wanting processed foods, it's something our bodies learn to want, and can just as easily unlearn. Try having a square of chocolate to beat the cravings, and resist eating the whole bar. Overcoming the sugar monster is different for everyone, so try the different solutions below until you find what works for you. • For some, going ‘Cold Turkey’ works best, after about a week cravings should almost completely disappear. It’s difficult to start with but gets easier and is worth the challenge. • On the opposite approach, you could also try eating much smaller portion so that you don't feel deprived. If you can't quit sugar completely, practicing portion control will at least help keep excess calories, fat, carbs and sugar down. Think a truffle (not the box), small FroYo not covered in syrup & extras, a cookie rather than a pint/packet/huge slice(s) of anything! Although the occasional splurge is fine, make sure it's not a daily habit. • Try combining something unhealthy with something healthy e.g. yogurt and honey, dark chocolate coated almonds, chocolate dipped fruit. This won't curb cravings but it will help you eat in a more balanced way. • Keep a healthy snack to hand like dried fruit, fruit, raw unsalted nuts. Sometimes satisfying hunger first, or just the habit of hand-to-mouth will curb your craving. • Eat regularly so that you don't get too hungry, or let your sugar levels drop too low, as that will only make cravings worse. A little naughty, a little nice, it's all about balance and eating real food(s). If you fall of track, don't be too hard on yourself or use it as an excuse to stay off track. Enjoy it for the treat it was and then choose to eat healthily again. Put that sugar monster to rest, or at least make him snooze! 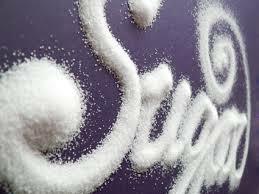 What tips do you have to help resist refined sugars? Share them with us below.